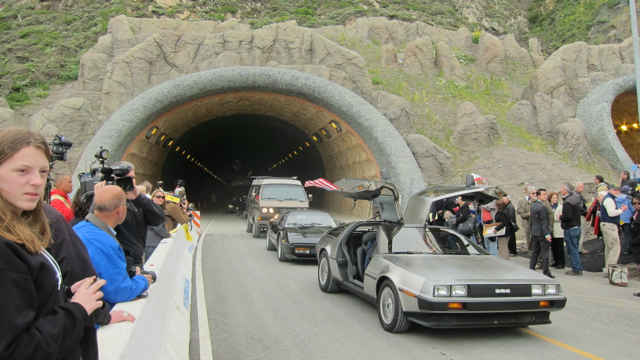 The Devil’s Slide Tunnels south of Pacifica and north of Half Moon Bay are finally opening after decades of environmental battles and years of construction. 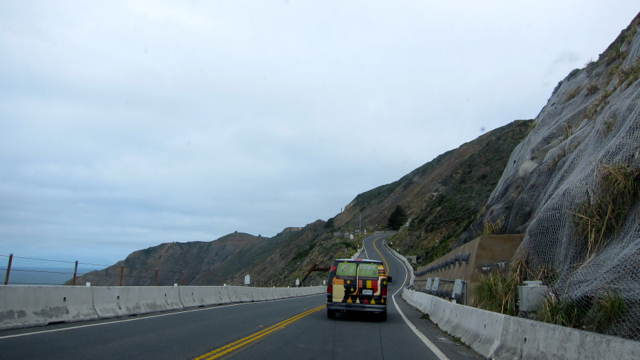 The tunnels are meant to solve the safety and erosion problems that have plagued that notorious stretch of Highway 1 since it was built. 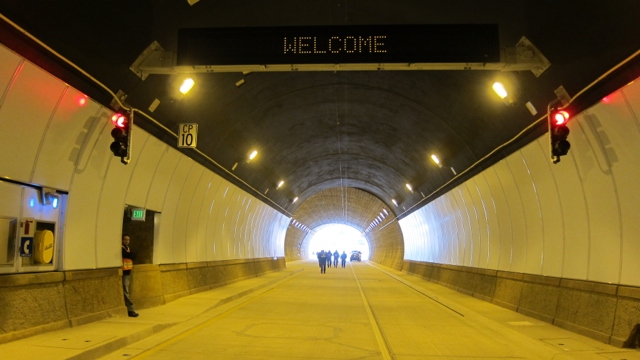 The new tunnel consists of two bores each about 4,200 feet long and each with one lane and wide shoulder. The cutting edge tunnels have been a major engineering project and will feature jet-powered exhaust fans and carbon monoxide sensors. 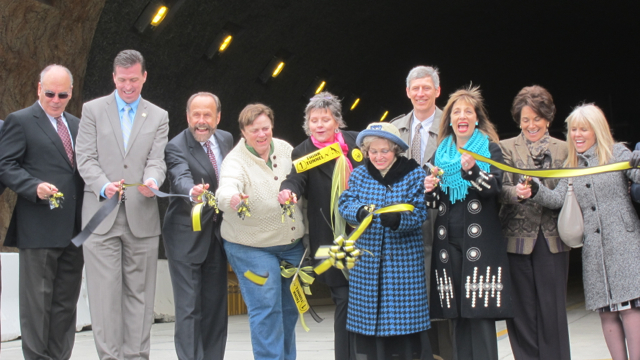 A couple hundred people turned out for today’s ribbon cutting ceremony including Congresswoman Jackie Speier and the wife and daughter of the late Congressman, Tom Lantos whose lobbying efforts help lead to the construction of the new tunnels. Also present at the opening ceremony was the Half Moon Bay High School marching band and a number of environmental activists who pushed for the tunnels. 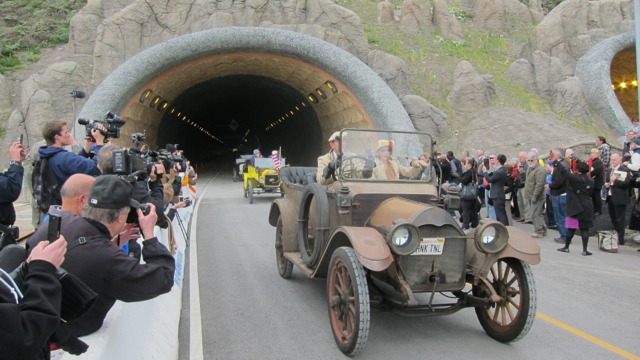 A parade of antique cars were the first vehicles to drive through the new tunnel. 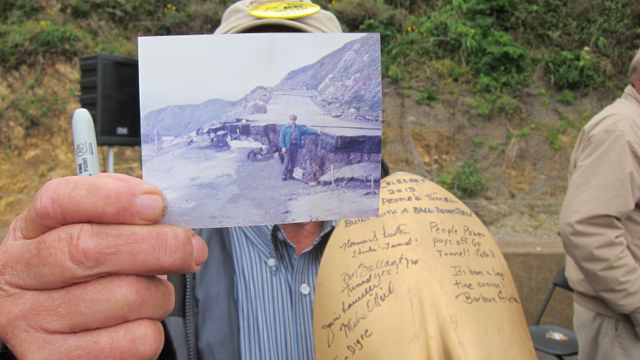 Pacifica resident Mike Mooney holds a picture of himself next to a stretch of Devil’s Slide during one of the more memorable highway closures. 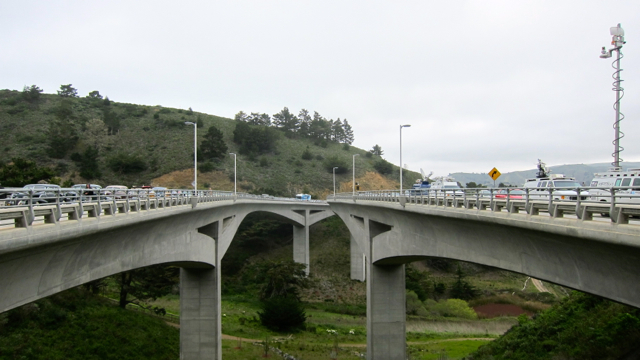 Two new bridges connect Highway 1 to the tunnels and bypass red-legged frog habitat in the valley below. The 439-million dollar tunnels are the first to open in California in nearly fifty years and are the longest tunnels in the state. 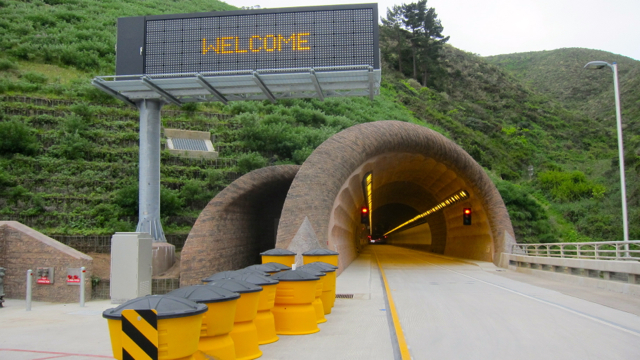 CalTrans plans to open the tunnels to traffic tomorrow morning. As for the old stretch of highway with breathtaking views? It will soon open to hikers and cyclists. This video shows a CalTrans bus carrying select members of the public and media driving through the west tunnel. 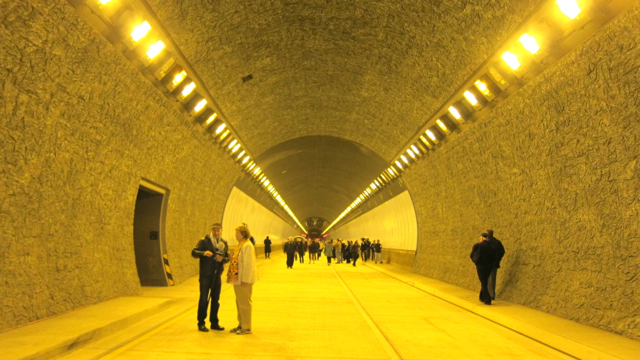 The footage is sped up and does not show the entire length of the tunnel; it focuses on the entrance and exit. Andrea Kissack contributed to this report. Photos and video by Jenny Oh. It’s a shame you didn’t mention both bands that performed. Terra Nova High School band from Pacifica was in the lead with their black and gold uniforms. I drove that stretch of highway this morning around 4am on my way to SF airport to fly home to Canada. I was reflecting as I was driving it that I would be one of the last people to drive that road. Very beautiful. 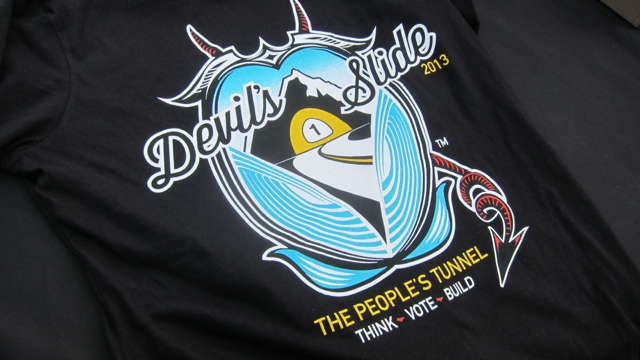 Wonderful, fabulous tunnels – something to be really proud of. Too bad it took over 30 years of political wrangling for them to become a reality. Is this now a safe route for bicycling between Pacifica and Half Moon Bay? 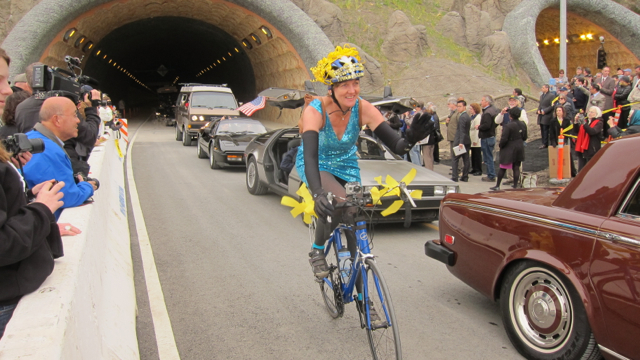 Will bikes be able to use both the tunnel and the old road? Thanks. Love the shirts from your picture, and found them online. Local Montara business! plans to open the tunnels to traffic tomorrow morning.” No they are not the longest tunnels in the state. The Wawona Tunnel that provides access to the Yosemite Valley in Yosemite National Park is still the longest at 4,233 feet compared to the Devil’s Slide Tunnels at 4,149 ft (northbound) and 4,008 ft (southbound). Someone can’t do simple arithmetic, apparently. Geez, Todd lighten up. Only 100 feet off. We are just happy to finally have it finished! Todd is right.Even if off by only 100 feet, that distance is the difference between an accurate report and a mistake. 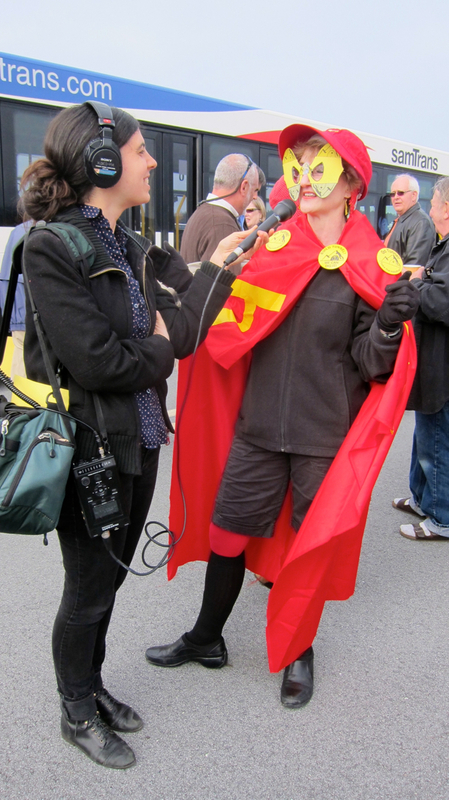 But the woman in red with yellow mask she looks rediculous! Why make so much out of a pair of tunnels? It is stupid!